CarMax is a Fortune 500 used car retailer that was founded in 1993. They have locations all over the United States. Their services include: buying used cars to resell, selling used cars, providing vehicle research information through their online presence for car shoppers, and offering auto financing. They have sold over six million vehicles to American drivers across the country, and feature a ready-to-buy stock of tens of thousands of available cars at any given time. CarMax offers a lot of different services to consider, making it totally different from most of the car research sources that we have reviewed. As a brick-and-mortar used car dealership, CarMax was founded on the idea that customers don’t want to be pressured into purchases by pushy salesmen. Rather than use high-pressure sales tactics and gloss over car features, CarMax relies on its image of honesty, presenting a clear picture of each used vehicle’s condition through an extensive pre-sale inspection. They also have a company policy that doesn’t allow haggling on pricing – what you see is what you pay. They offer warranties, and for sellers: CarMax’s official policy is that they will buy your used car from you no matter the age or condition. Their online presence is unique in that you can actually count on the prices you see listed there to be genuine and reliable. Users can browse by make and model, compare and contrast cars by type, and even get information on fuel savings and current auto industry trends. Web browsers can also use the CarMax website to fully investigate their financing options, including going through an entire online loan application process, making payments for their car from CarMax, or just doing research with the payment calculator. CarMax details every car that it sells after putting them through inspection, so that they always feel and look new. It’s important to note that from 2011 till about 2014, the FTC was asked several times to investigate CarMax, due to CarMax’s not checking used cars for recalls or major past damage before selling them. The investigations did not find any serious conclusions, and for the most part, complaints seem to largely stem from the fact that CarMax doesn’t negotiate its prices. 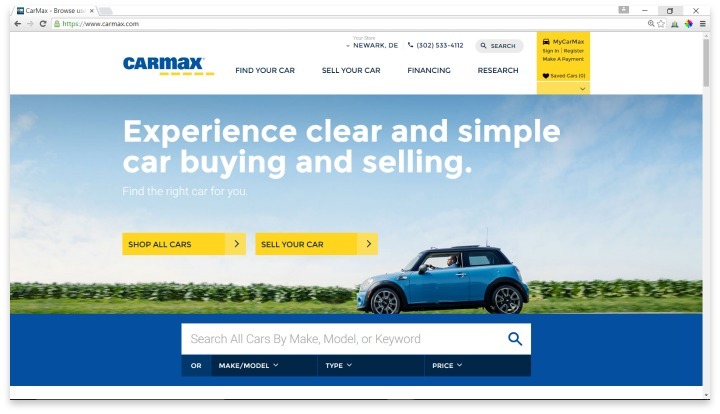 CarMax services include buying used cars to resell, selling used cars, providing vehicle research information through their online presence for car shoppers, and offering auto financing. If you want to buy a used car, and you want to know that that car is going to come to you in great condition, you could do far worse than CarMax. While their prices may be slightly higher, and you may not get as much as you could in return for your used car, what you do get is a low-stress car buying experience. All listings include VIN information, so it’s easy to run a CARFAX report to uncover any serious problems with a car; the information and financial services available on the website make CarMax a good choice overall for car shoppers who aren’t interested in all the fuss. The only reason that CarMax wouldn’t be for you is if you are on a strict budget, and need to obtain the most affordable car possible. Have you had an experience with this company? Please share your CarMax reviews below.